Raspberry Pi’s Rob Bishop made a stop on his 2nd Raspberry Pi U.S. Roadshow last night to speak at Pumping Station One, a popular makerspace/hackerspace in Chicago. 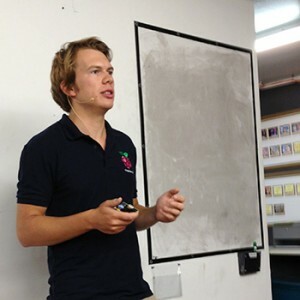 I thoroughly enjoyed his presentation, Raspberry Pi – One Year On, as well as the generous Q&A session that followed. I also managed to score a bit of Pi-swag, including a great little logo sticker. Much of the engineering support workload in the first year has been driven by the far greater number of purchasers and their far greater number of use cases than had been expected. The USB port issues were his primary example. While the team’s testing had focused on common use cases like keyboards and mice, problem reports arrived from users trying to communicate with a wide range of exotic USB-controlled devices. I think Rob’s example of a USB-controlled aquarium might have been a humorous exaggeration. Yet, from the wide range of projects that the attendees reported having underway with the Pi, the aquarium seemed fairly mundane. While the audience of approximately 30 people was made up almost entirely of adult Pi enthusiasts, I did see one grade school aged participant who had come with his dad. Rob acknowledged that the unexpectedly large adoption of the Pi by adult hobbyists had been a happy surprise. Yet, the focus of the Raspberry Pi Foundation will continue to be that of promoting computing literacy for the school-aged audience. Keeping his immediate audience in mind, Rob took great care to emphasize the important role that the adult enthusiasts play in helping the foundation to create and maintain an infrastructure around the Pi that will make its adoption by educators easier. I also enjoyed the opportunity to tour Pumping Station One. It is an impressive facility that supports its over 200 members in maker activities of all kinds. Some of these activities include the integration of computers like the Raspberry Pi into custom solutions that control everything from beer brewing to building access. There was also a wide array of computer-controlled equipment that is beyond the budget of your average maker. This included a 3-D printer, a laser cutting machine, and 2 small CNC routers. The scale of this place, with its wide array of shop equipment, electronic components and workspace is amazing. Much of my interest in makerspaces has been fueled by the interest that some of my current and former students at GSLIS have been showing in developing makerspaces in libraries and museums. My visit to Pumping Station One convinced me that my students are definitely chasing after a good opportunity. Makerspaces like Pumping Station One are clearly aimed at an adult audience. The access, the safety program, the level of supervision and the culture make this a great place for adults to learn and work. So, I believe that there is still plenty of room for libraries and museums to create these same kinds of opportunities in an environment that has traditionally met the additional needs of children, young adults, and families. My next step will be to find an example of a library or museum makerspace that I can visit. If anyone has a suggestion, please contact me. I will close by thanking Rob Bishop for his great presentation and Pumping Station One for their great hospitality. It was a truly enjoyable night.